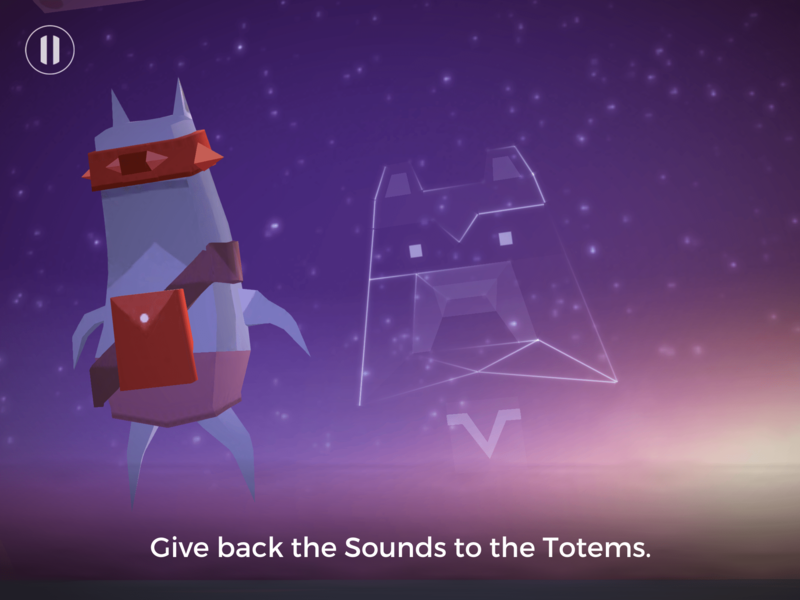 If at first glance you think Adventures of Poco Eco – Lost Sounds is a sequel to Monument Valley, or at least inspired by it, I don’t think anyone could blame you. 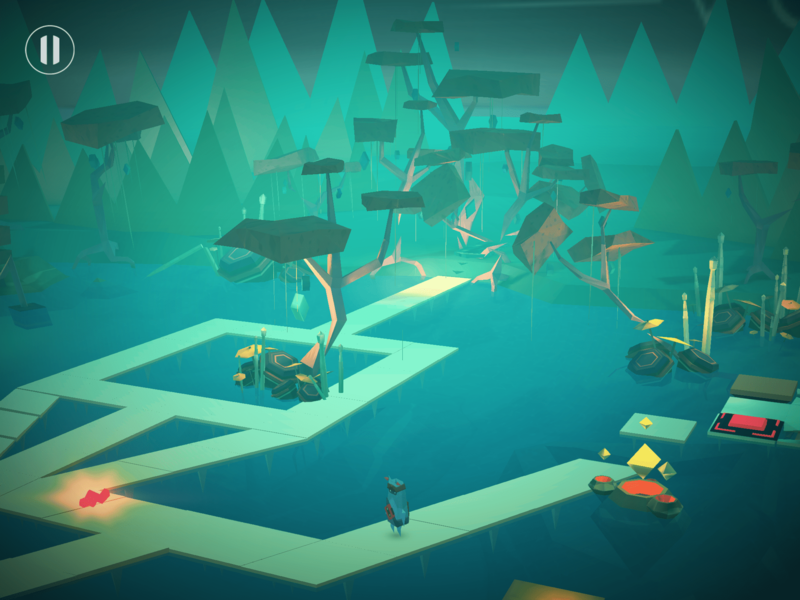 There certainly are a lot of similarities, including the gorgeous low-poly art style, bite-sized levels, and the tap-to-move puzzle aspects. 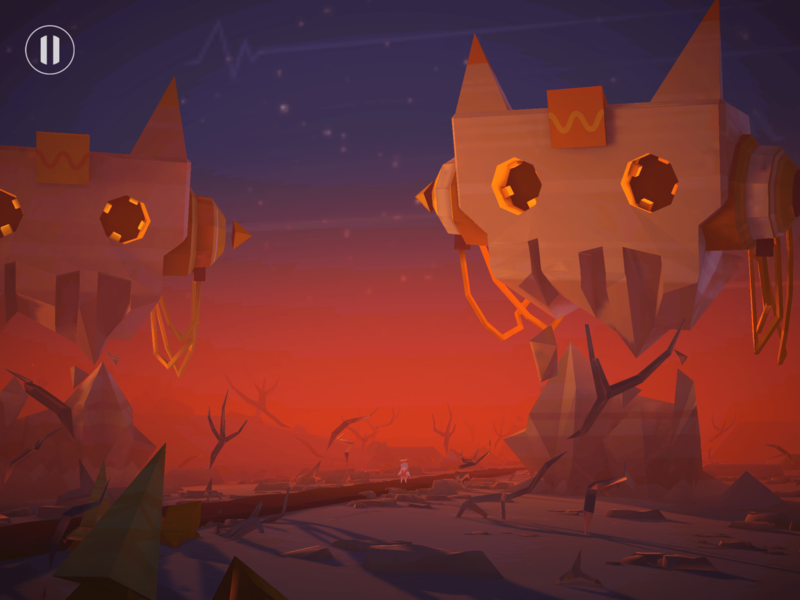 However, Poco Eco offers a unique enough experience that any fans of the art style and ambient music should definitely check it out. To be honest, I’d never heard of the Hungarian musician Iamyank before I had seen artwork for Poco Eco, a game designed for touchscreen devices alongside his new LP called Lost Sounds. Iamyank describes his music as “dreamy electronic,” and I think that’s a good description. As a long-time fan of music that could fit in the genre, such as Robert Miles’ Dreamland and the many works of Mike Oldfield, Iamyank’s music is right up my alley. As Poco Eco bops his head along with the music, I can’t help but do the same. It is a great soundtrack for this type of game, and I wouldn’t mind seeing more collaborations between musicians and game development studios. 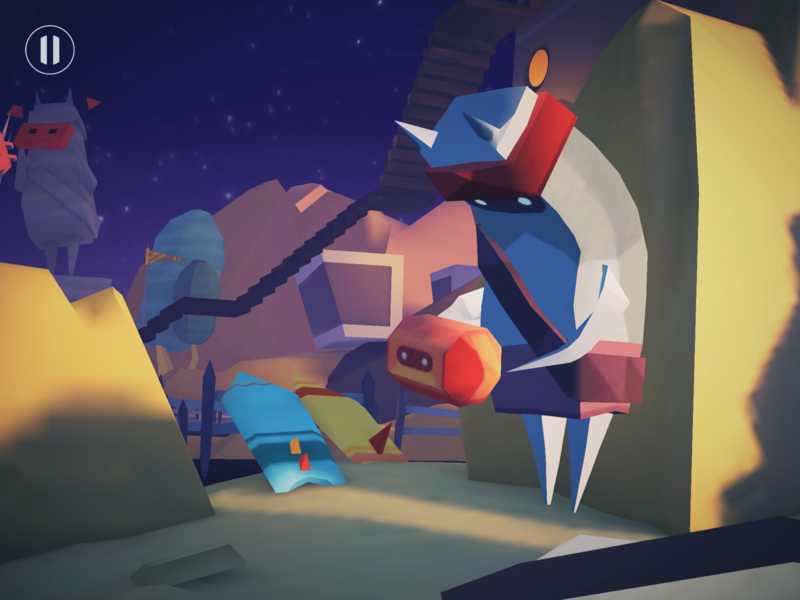 As for the game itself, you take control of a cute little bipedal ambiguous animal-like creature named Poco Eco. He comes across the Lost Cassette, which starts pumping music into his ears through little floating earbuds, occasionally inspiring him to break out into a cute little dance. With this cassette in hand, he is sent on a journey through gorgeous landscapes to give the sounds back to the Totems. Each Totem, or Spirit, you speak to will tell you a little bit more about the land and its history, but the messages are slightly cryptic and poetic. The Spirits themselves are quirky and full of character, making me eager to meet each one. There are twelve unique levels of varying length and difficulty. They each consist of puzzles in which you need to find the Amp and activate it by feeding it music. Only then will all the buttons be activated and available for you to press. When Poco Eco steps on a button, it will cause something to happen, such as a platform shifting or rising. You need to find a way to get to each button, which will enable you to get to the next one, and so on until the path is clear for you to go through to the next stage. 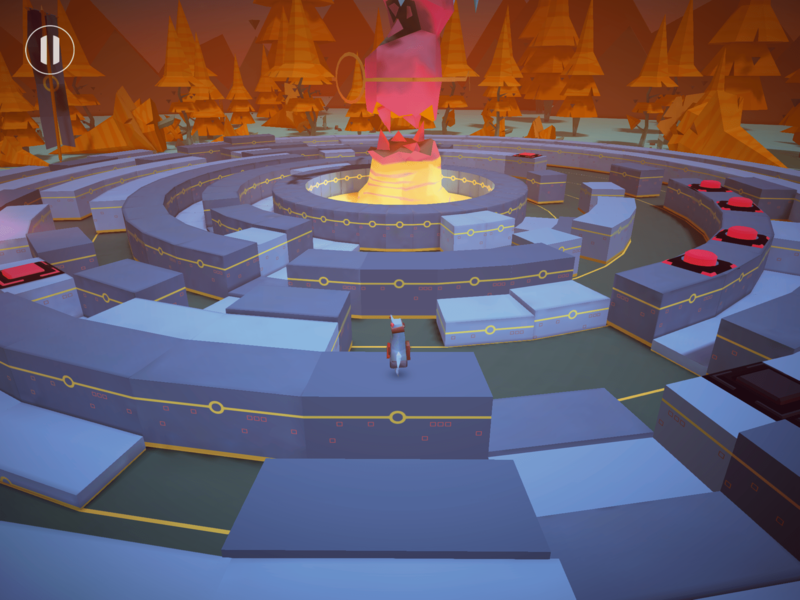 The puzzles don’t offer that much of a challenge, though there were a few moments where I had to mess around a bit to find the solutions, such as the light reflecting puzzle. But for the most part, it’s quite an easy game, as you have a little winged friend called Ledbug who leads you just about every step of the way. But the game is advertised at ages 6-8, so I can’t really complain about that. While many similarities can be made to Monument Valley, there are also quite a few differences. For starters, most level maps are much larger, and the camera sometimes gets in the way of things, especially on my small iPhone 5 screen. I enjoyed it more on my iPad’s larger screen, but there were still times I wished I had control over the camera, both to zoom in and out and to move it a bit so I could see what was off to the side before heading over there. One thing that Monument Valley had that I miss here is some feedback when you tap a spot. It’s hard to tell sometimes, when Poco Eco won’t respond, whether it’s because you can’t move there or because the game didn’t register your tap. I never had that confusion in Monument Valley. Still, considering the puzzles aren’t too difficult to begin with, these small issues shouldn’t cause too much of a problem. If I’m not mistaken, the game cycles through the entire Lost Sounds LP, so you’re not listening to the same song the whole time. This provides enough variety to keep the music from getting stale. 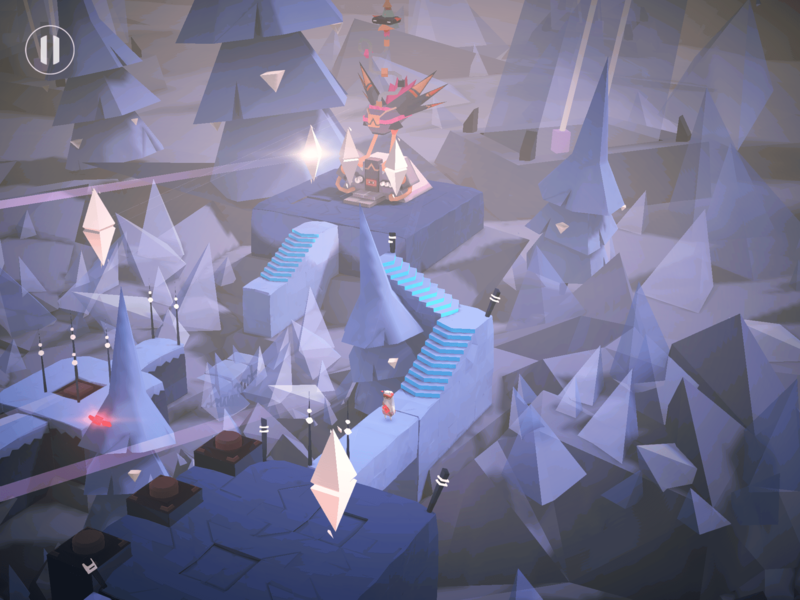 There are also scenery bits throughout the game that act as instruments, which you can tap to create additional noise. This allows you to add to the soundtrack and feel like you’re partiticpating in it. Again, this idea was also present in Monument Valley, but it would be silly not to expect a game designed around a soundtrack to also utilize this feature. If you already have the game and need help with it, try my Poco Eco walkthrough. I’m a few levels in & really enjoying it. Playable art or game-able art. I too would like control of the view or camera every so often. But all in all its really fun. Not hard, not too challenging, just a fun time. Sometimes my brain needs a rest & to I just enjoy an experience. This game gives that to me. Did it sound like I didn’t like the game? Was I too harsh? No worries. 🙂 Thanks for clarifying!